I love a challenge and when our friend G asked I use truffle oil into a dinner I prepared, the first thing that came to mind were truffle fries. In fact, that is probably my favorite way to use truffle oil or salt! For more additional flavor, I prepared these Rosemary Garlic Truffle Fries which were oven roasted with garlic, rosemary and a touch of truffle oil before tossing with fresh parsley. Truffle oil probably isn't in everyone's pantry either because it's not exactly a common ingredient nor is it affordable. But if you do have it on hand and need an idea to use it, this recipe will come in handy. Then again, you can omit the truffle oil all together and double up on the olive oil instead! 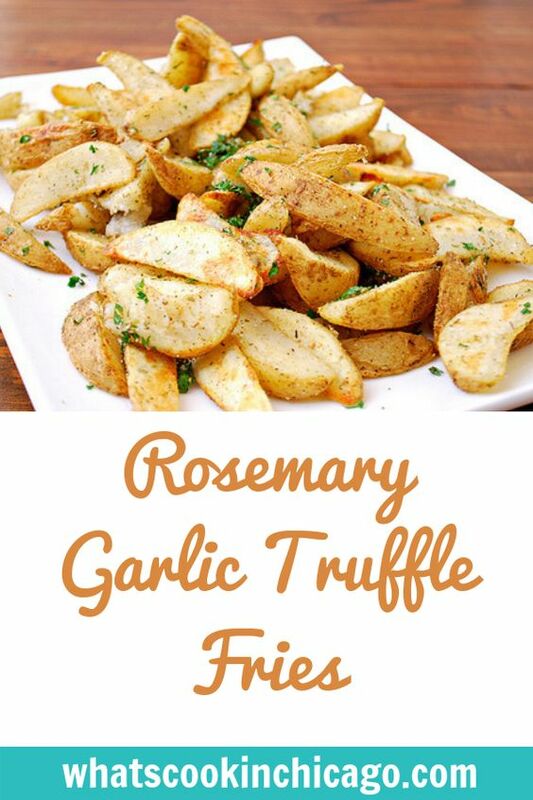 In a large bowl, combine the potatoes, garlic powder, rosemary, salt and pepper. 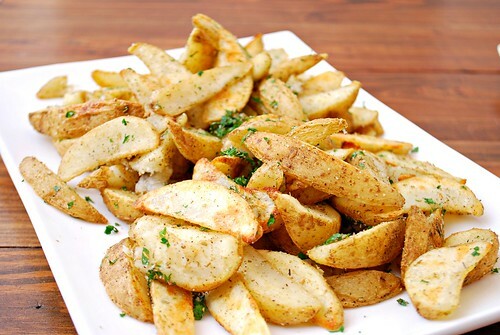 Drizzle the olive oil and truffle oil over the potatoes and toss to fully coat potatoes with oil and seasonings. Arrange the potatoes in a single layer on the prepared baking sheet. Bake in the preheated oven for 25-30 minutes or until the potatoes are golden brown and crisp. Transfer potatoes to a serving platter and garnish with minced parsley. omg I am so craving anything carby right now. And Truffle oil? yummy! OK, this looks amazing (need them in my tummy right now). Not fair to have to see such yumminess so early in the morning! Oh yum! These would be perfect with the kabobs I have planned for this weekend. i love wedge fries, i'll have to try these! Oh my! Those look delicious and I love making homemade fries and these look like a great new flavor to try! Okay, these sound really really good, but I have no idea what truffle oil is. I'm an Idaho girl..I LOVE potato treats! These look amazing! Yum. Must try them!